At the very least you’ve summarized your progress on three pages with your logo on the bottom and dessert smudges on the cover. Or maybe that was me. Either way, the reports you deliver during a consulting engagement inform and direct your client. Are you taking the time to produce the internal reports that inform and direct the health of your consulting firm? Whatever aspirations you harbor for your consulting firm, you need to know how you’re performing. That’s how you identify barriers and plan future progress. The five reports below are mandatory to steer your consulting firm toward a better future, whether your firm has one or 101 consultants. You’re recording your (team’s) successes, accomplishments and achievements. Your upcoming delivery capacity requirements. Predict your cash position over time, so that you can identify and avoid cash crunches. 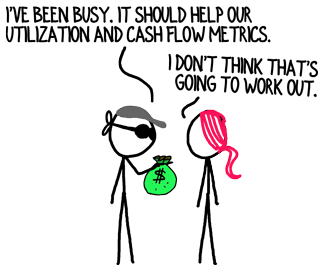 Most of the consulting industry misuses the utilization metric. The percentage of hours spent on billable work is misleading and scrutinizing that statistic is counterproductive. The overall capacity of your firm to create value for clients and profit for you. If you’re using software to generate your P&L, that software will also spit out a balance sheet. Easy peasy. Whether or not you need it depends on the size of your firm and your long-term intent. If you’re striving to build a salable asset, then you need to keep your balance sheet healthy. A firm laden in debt or without clear financial controls is a tougher sell. Do you use reports to guide your consulting firm? I’d like to hear what you’re doing. Totally agree, Dennis. When I was talking with my colleague Richard, who’s a consulting firm operations wizard, and he mentioned the standard reports he likes to see. Let me know how you fare when you start regularly accessing these 5 reports for your own practice, Dennis. I am very grateful for your advice every month. Of course the sale if your book is one of your goals but when I met you here in Brunswick, ME a few years ago I could tell you sincerely want to help folks. Most of us in this profession have learned that immense joy and satisfaction comes from helping others succeed. I bet that’s why you’re in the business of advising others, too! Also, thank you for the very kind words, Evan. I’m equally grateful that you take the time to read and offer your thoughts as a comment. Good stuff. And a quick indicator of awareness and ability. Next question is how quickly can you produce that info and how many people and systems are invovled to get that data? I knew some smart consultant would point to that series of questions, and that smart consultant is you, Ray.